A devastating wall of water gushed down the Bhotekoshi/Sunkoshi River in Nepal on July 5, 2016. It came from a lake that had been dammed by a glacial moraine, but the dam broke and discharged more than 100,000 tons of water all at once. 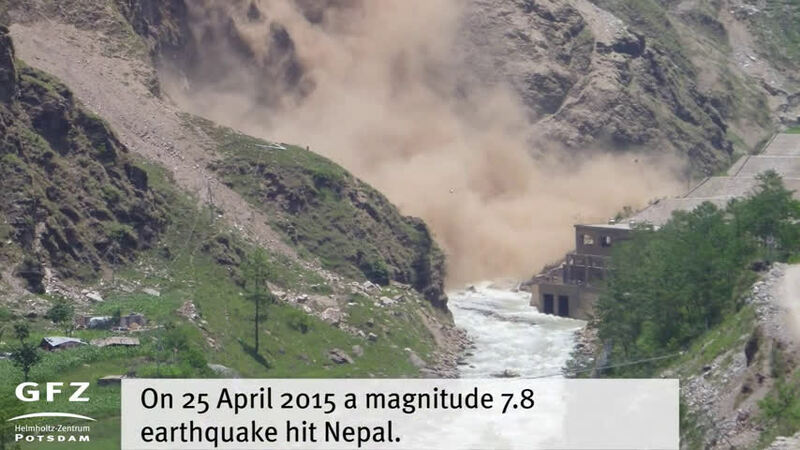 An international team of GFZ and Nepali scientists was able to record the sudden outburst with seismometers deployed the year before in the wake of the catastrophic Ghorka earthquake in April 2015. In a study to be published in Science, the authors argue that such major flood events have a greater impact on erosion rates than the annual monsoon rainfalls. The reason is that the water masses mobilize large boulders and coarse sediment which usually protect the riverbed. During monsoon seasons, only finer sediment and pebbles are transported downstream—not enough to trigger landslides and massive erosion. "Erosion rates may be strongly influenced by non-climatological drivers such as earthquakes and the climatic factors that affect the size and distribution of glacial lakes," the authors write in their paper. Kristen Cook, member of Niels Hovius' team at the GFZ and first author, visited the valley before and after the flood. Several lucky circumstances surrounded the event: The flood occurred in the evening when people were around their homes home but not asleep, and it was so powerful that it caused to ground to shake, says Kristen. She talked with two local residents who felt and heard the flood approaching. The younger one told her that he had thought of an earthquake but his elder companion remembered another flood from 1981 and urged to climb away from the river. Other people reacted similarly and fled in time so no people were hurt. However, there was substantial damage to infrastructure. From the scientists' point of view, the researchers were lucky to have deployed seismometers in the valley well before the flood occurred. The ground shaking felt by valley residents was also recorded by a network of seismic stations, the first time that a glacial lake outburst has been captured by seismometers in close vicinity and with such a high resolution. Using seismic data to study floods is a new and developing technique that lets scientists see thing that were impossible to observe using traditional river monitoring. "We could identify two distinct pulses," says Kristen Cook. The first came from the wall of water, the second one only seconds later from rocks and coarse sediment within the water. The latter caused the biggest damage. Bridges were destroyed as well as hydro-power stations and roads. 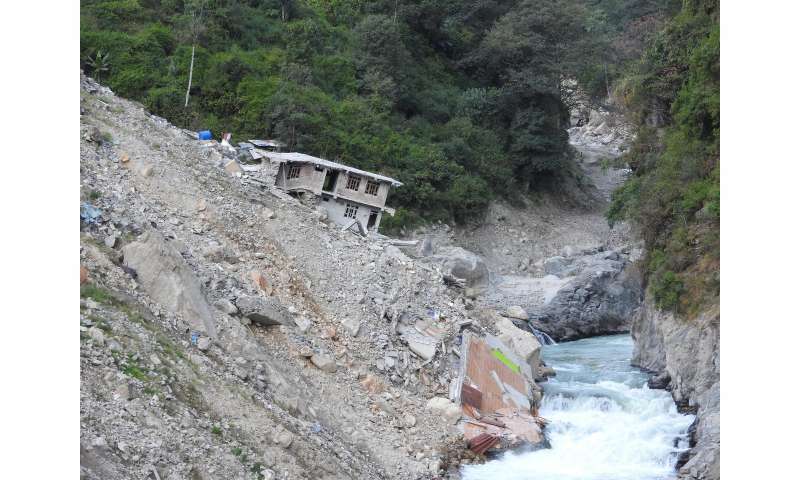 In the aftermath, a number of landslides came down as the river banks were destabilized by the erosive force of the water. As there are many glacial lakes, either dammed by glaciers or by land ridges, in the Himalayas and other mountain ranges world wide, the findings of the team are of great importance. To calculate erosion rates and the risk of landslides, it is necessary to take into account factors such as earthquakes, melting glaciers, air temperature, and glacial recharge of lakes. Things get even more complicated: "Even where lake outburst flood-frequency can be linked to precipitation, the relationship between fluvial erosion and precipitation will become non-linear," conclude the authors. Climate change with rising temperatures may worsen the situation and increase the risk of communities in mountainous regions prone to earthquakes. The study is titled "Glacial lake outburst floods as drivers of fluvial erosion in the Himalaya."